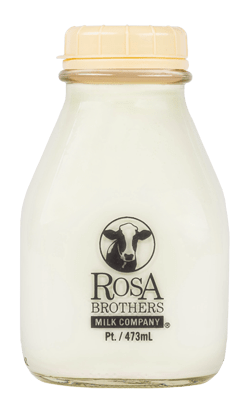 This strawberry bliss is a combination of fresh cream straight from our own Rosa Brothers Milk Company cows, real strawberries, and sugar. The beautiful blush color you see in this pint is all natural — no artificial red coloring whatsoever. 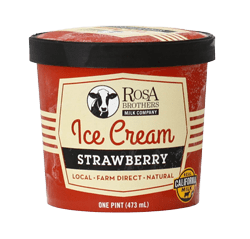 Ingredients: Cream, Milk, Sugar, Strawberries, Locust Bean Gum, Guar Gum, Carrageenan, Natural Flavors. Processed in a facility that processes peanuts, tree nuts, eggs, wheat and soy. 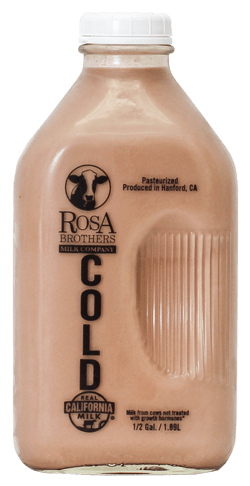 Your friends over at Rosa Brothers Milk Company promise this pint is chock full of chocolate pleasure. Only fresh dairy milk and cream our own farm is allowed in this chocolatey pint. Top quality cocoa and other supreme ingredients are added to this little treasure. This cool refreshing dream is comprised of a creamy, crisp mint and decadent chocolate to provide an awakening to the senses like no other. We make sure that every spoonful from this pint has the perfect amount of chocolate to melt in your mouth. Ingredients: Cream, Milk, Sugar, Chocolate Chips (Sugar, Coconut Oil, Cocoa Powder, Nonfat Milk Powder, Whole Milk Powder, Milk Fat, Soy Lecithin, Natural Flavor), Water, Natural Flavor, Corn Starch, Citric Acid, Locust Bean Gum, Guar Gum, Carrageenan. CORN STARCH, NATURAL FLAVOR, CARAMEL COLOR, SALT), SEA SALT. (SUGAR, WATER, SALT, CORN STARCH, NATURAL FLAVOR [CONTAINS HAZELNUTS]). Ingredients: MILK, CREAM, SUGAR, NATURAL VANILLA FLAVOR. The serving size information above is for the pint size of this product. Ingredients: Whole Milk, Vitamin D3. The serving size information listed above is for the half-gallon size of this product. Ingredients: Reduced Fat Milk, Nonfat Dry Milk, Vitamin A Palmitate, Vitamin D3. Ingredients: Skim Milk, Nonfat Dry Milk, Vitamin A Palmitate, Vitamin D3. Ingredients: Whole Milk, Sugar, Cocoa Processed With Alkali, Cornstarch, Salt, Carrageenan, Vanilla, Vitamin D3. The serving size information above is for the quart size of this product. 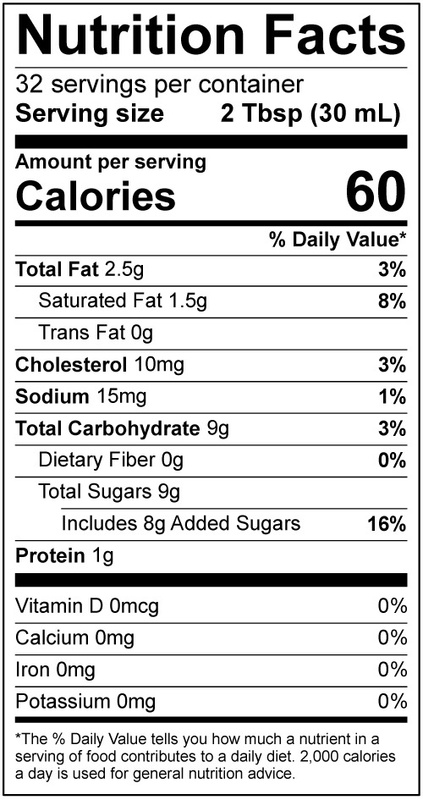 Ingredients: Whole Milk, Sugar, Dextrose, Natural & Artificial Flavor, Cornstarch, Carrageenan, Yellow 5, Vitamin D3. The serving size information above is for the half-gallon size of this product. Ingredients: Whole Milk, Sugar, Contains 2% or less of Natural Flavors, Beet Powder (Color), Carrageenan, Beta Carotene (Color), Vitamin D3. 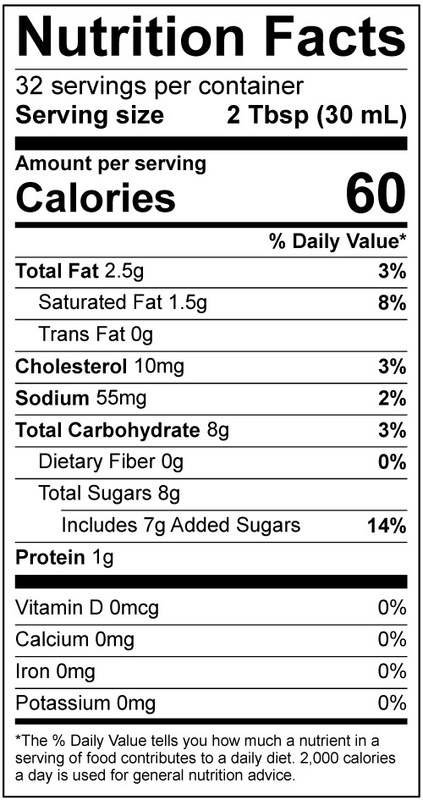 Ingredients: Whole Milk, Sugar, Dextrose, Natural And Artificial Flavors, Corn Starch, Carrageenan, Yellow 6, Vitamin D3. Ingredients: Whole Milk, Sugar, Dextrose, Natural & Artificial Flavor, Carrageenan, Caramel Color, Vitamin D3. Nonfat milk, cane sugar, water, contains 2% or less of: rice starch, cinnamon, natural flavors, citric acid, disodium phosphate, gellan gum, vitamin A palmitate, vitamin D3. Contains milk. Processed in a facility that process peanuts, tree nuts, eggs, wheat and soy. Ingredients: Whole Milk, Sugar, Dextrose, Cornstarch, Caramel Color, Artificial Flavor, Carrageenan, Vanillin (An Artificial Flavor), Vitamin D3. 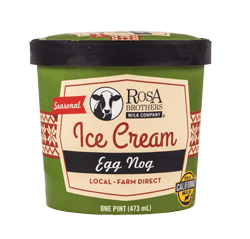 Enjoy some holiday cheer with the creamy combination of eggs and spices that we include in our famous Egg Nog, but in a flavorful super premium ice cream. This holiday favorite is sure to be a reason for cheer! Ingredients: Cream, Milk, Sugar, Water, Egg Yolks, contains 2% or less of: natural flavor, Nutmeg, Annatto (color), Citric Acid, Turmeric (color), Ginger, Locust Bean Gum, Guar Gum, Carrageenan. 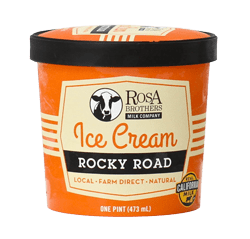 With the dense, rich Rosa Brothers super premium chocolate ice cream as the foundation, and real California almonds broken down into crunchy bits, blended together with real marshmallows, you’re sure to be delighted with the creamy, crunchy, and spongy textures in our Rocky Road. Ingredients: Cream, Milk, Sugar, Almonds, Marshmallows (Corn Syrup, Sugar, Modified Corn Starch, Dextrose, Water, Gelatin, Natural And Artificial Flavors, Tetrasodium Pyrophosphate), Cocoa Powder Processed With Alkali, Vanilla Extract, Locust Bean Gum, Guar Gum, Carrageenan, Salt. 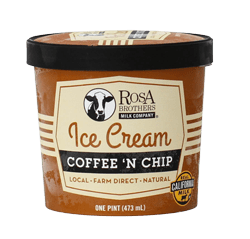 This pint of joe combines our rich, creamy ice cream base, high quality roasted coffee, and milk chocolate chips to sweeten the pot. The result is a pure ice cream experience leaving coffee lovers begging for more. Ingredients: Cream, Milk, Sugar, Chocolate Chips (Sugar, Coconut Oil, Cocoa Powder Nonfat Milk Powder, Whole Milk Powder, Milk Fat, Soy Lechithin, Natural Flavor), Coffee, Vanilla Extract, Locust Bean Gum, Guar Gum, Carrageenan. Orange cream, our most nostalgic ice cream offered. Inspired by the orange sherbet bars with vanilla in the middle you had as kid on hot summer days. 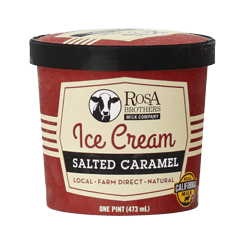 Well, we have taken those flavors and made an ice cream flavor that will take you back to the good ol’ days and delight ice cream lovers of any age. Ingredients: Cream, Milk, Sugar, Dextrose, Locust Bean Gum, Guar Gum, Carrageenan, Natural And Artificial Flavors, Yellow 6. 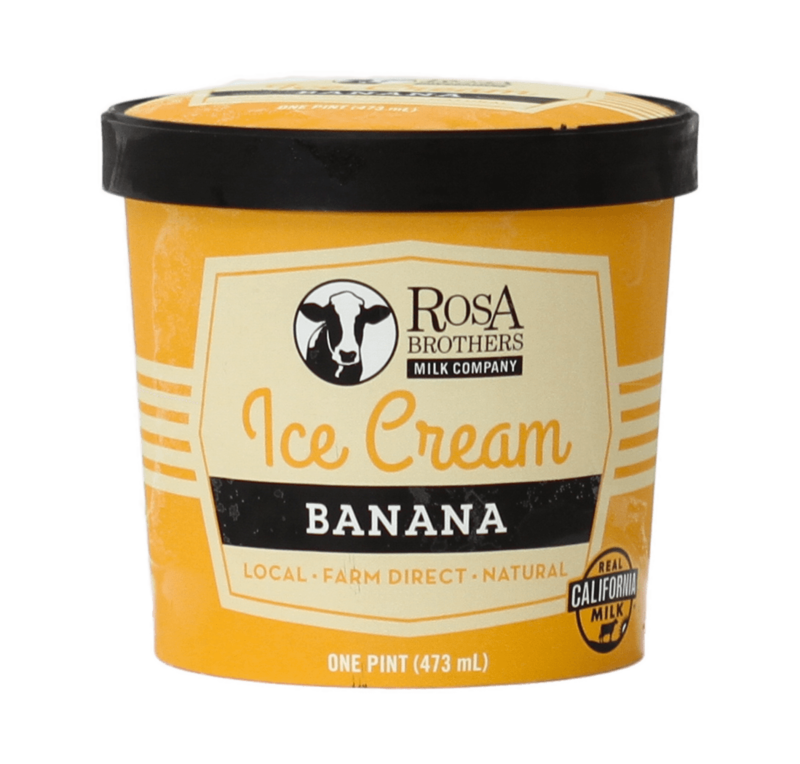 Rosa Brothers Milk Company prides itself on producing the creamiest, freshest banana ice cream in the world. 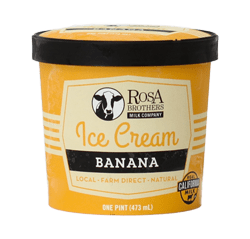 Only fresh bananas are allowed creating an off white color to this pint and we never add artificial coloring to our super premium ice creams! Ingredients: Cream, Milk, Sugar, Banana, Locust Bean Gum, Guar Gum, Carrageenan, Natural Flavor. 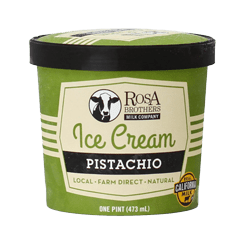 This super premium pistachio ice cream is a smooth, creamy, and flavorful experience. Only real California Pistachios are allowed in this pint sized prize. This natural beauty needs no artificial green coloring to make it beautiful. 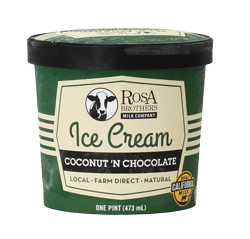 We created a mind-blowing flavor sensation when we combined fresh, sweet cream, local California almonds, tropical coconut flakes, and sweet milk chocolate chips. All gently blended together to make you beg for another scoop! Ingredients: Milk, Cream, Sugar, Chocolate Chips (Sugar, Coconut Oil, Cocoa Powder, Nonfat Milk Powder, Anhydrous Milk Fat, Soy, Lecithin, Natural Flavor), Coconut Flakes (Coconut, Sugar, Water, Propylene, Glycol, Salt, Sodium, Metabisulfate), Almonds, Coconut Extract, Vanilla Extract, Locust Bean Gum, Guar Gum, Carrageenan. Filled with the finest cookie ice cream in planet earth, this pint will bring happiness to anyone with a spoon. Starting with fresh sweet cream to make mouth-watering vanilla ice cream, then as it freezes, we add just enough top brand cookies to give every bite a magnificent cookie flavor. Finally, as it leaves the freezer, chunks of cookies are added to ensure hidden treasures, so get digging! Ingredients: Cream, Milk, Sugar, Oreo Cookie (Enriched Flour [Wheat Flour, Niacin, Reduced Iron, Thiamine Mononitrate, Riboflavin, Folic Acid], Sugar, Palm And/Or Canola Oil, Cocoa Processed With Alkali, High Fructose Corn Syrup, Baking Soda, Calcium Phosphate, Corn Starch, Salt, Soy Lecithin, Vanillin An Artificial Flavor, Chocolate), Vanilla Extract, Locust Bean Gum, Guar Gum, Carrageenan. This pint is simply full of passion. Our cows are passionate about producing the freshest and richest local ice cream around. They have teamed up with thousands of local bees that are passionate about making great-tasting honey and pollinating local almond trees. These local almond trees are passionate about providing the finest nuts in the world. 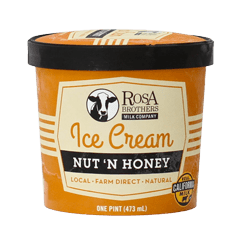 Add it all up and you have an exquisite nut n’ honey ice cream that is loaded with passion. Ingredients: Cream, Milk, Sugar, Honey, Almonds, Vanilla Extract, Locust Bean Gum, Guar Gum, Carrageenan. 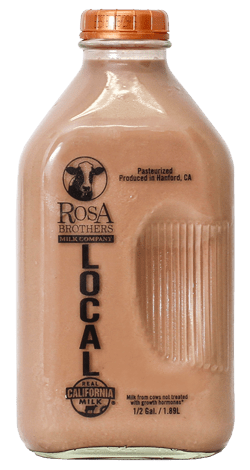 Rich, fresh cream straight from the Rosa Brothers Milk Company cows, combined with smooth milk chocolate chips that melt away in your mouth. 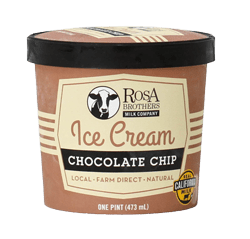 These chocolate chips are premium grade and your friends at Rosa Brothers add a plethora to each batch, so you’re never short on chocolate! Ingredients: Cream, Milk, Sugar, Chocolate Chips (Sugar, Coconut Oil, Cocoa Powder, Nonfat Milk Powder, Whole Milk Powder, Milk Fat, Soy Lecithin, Natural Flavor), Vanilla Extract, Locust Bean Gum, Guar Gum, Carrageenan. We present sweet, refined caramel blended with just the right amount of salt. This marriage between ingredients is sure to give you that sweet flavor that makes you long for another scoop. 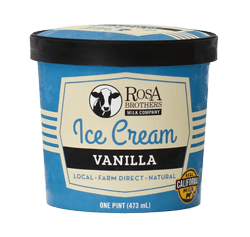 Ingredients: Cream, Milk, Organic Rice Syrup, Sugar, Water, Nonfat Dry Milk, Contains 2% or less of: Butter (Cream, Salt), Sea Salt, Natural Flavor, Sodium Citrate, Soy Lecithin, Pectin, Locust Bean Gum, Guar Gum, Carrageenan. Some say this is the most delicious pint of ice cream you will ever hold. 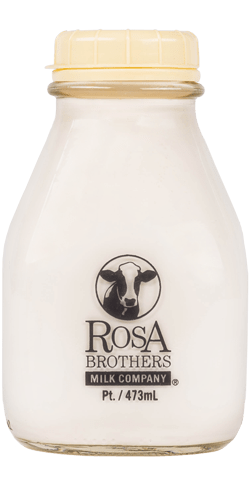 Fresh milk from the Rosa Brothers Milk Company cows goes into our deliciously sweet and creamy hand-made super premium ice cream. 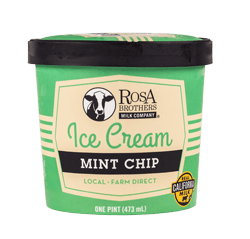 Good luck finding another ice cream on the planet made with such pride and attention to detail as this decadent creation from your friends over at Rosa Brothers. Ingredients: Milk, Cream, Sugar, Vanilla Extract, Locust Bean Gum, Guar Gum, Carrageenan.